Vespa scooters are a frequent subject of LEGO builds, including a white LEGO Vespa by Lucie Filteau and the minifig-scale Vespa by nieun we recently highlighted (complete with instructions). 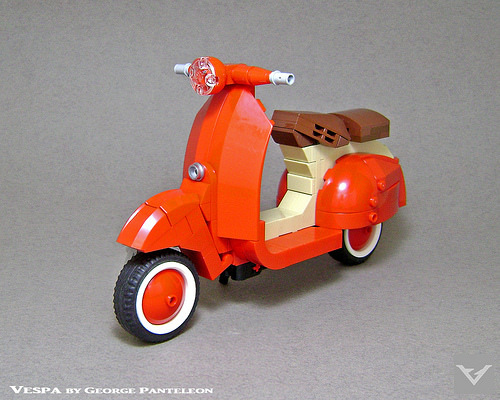 George Panteleon just posted what might be my favorite LEGO Vespa yet — a curvaceous beauty in red with white-rimmed tires. The whole build uses some serious Studs Not on Top building techniques, with rear wheel wells built studs-out and the foot rests built studs-forward, plus some wonderfully odd angles on the seat. It’s exceedingly rare that we highlight the fact that a LEGO build has been submitted to LEGO Ideas (so please don’t ask us to promote your project), but I think this wonderfully original LEGO creation deserves an exception. For an Ideas proposal, this is very elegant and self-contained. I am impressed!